Penrith Partnership, with significant input from the community, has produced a community plan for the town, which will guide development over the next five years. It sets out the things that local people want to change and improve, and how the community can make it happen by working together. 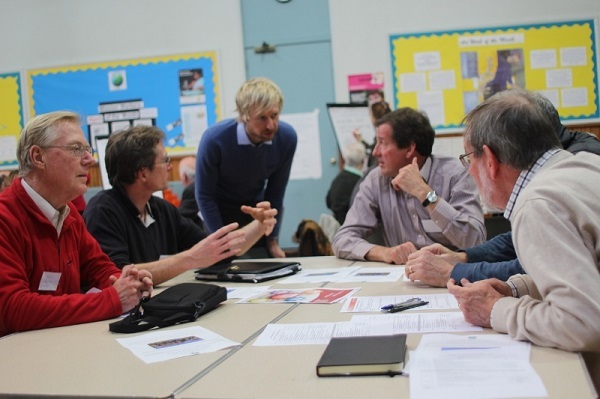 We have had extensive consultation with community groups and the community to find out the views of residents and groups on what they'd like to see happen in the town. We've held several community get-togethers, for residents and local organisations, along with an online survey. We have now finalised the Plan - linked below - although this will be subject to ongoing change both to reflect new ideas and input and to demonstrate the progress made in delivering the objectives. If you’ve any questions, please do get in touch. We attended the Future High Street Summit in Nottingham in March 2016, to see what we could learn for the Penrith Community Plan. This national two-day conference brought together experts from a range of disciplines that affect the development of town centres - from retail and economics to town planning. Visit our future high street summit page to view some of the speaker notes and read our presentation on what we learnt, which we were able to share with local partners back in penrith. The top issue around buildings and heritage in Penrith was providing new housing driven by need, rather than by what developers want to build. Better promotion of Penrith’s heritage, via signage and websites, was also considered essential, along with changing empty pubs in the town into spaces that could be used by the public. On the town’s economy, bringing back a thriving market to Penrith was far and away the most important issue. Encouraging independent businesses, dealing with empty shops and reducing business rates were also strong priorities. Under leisure, the highest priorities were providing more indoor facilities, such as a skate park, and a community arts venue or attraction to draw people into the town. Improving Castle Park, supporting cycling, and having more events and festivals were also in the top five. The attendees suggested there should be an audit of existing facilities to help identify gaps. On the town environment, the overwhelming priority was pedestrianisation to make the town centre a more attractive and pleasant place to be. Litter and dog fouling also came out high on the list, as did the need for an audit of historic and empty buildings. A long term strategy has been developed for the town - see above. Comments welcomed. On transport, the highest priority was promoting the community transport schemes that already exist, and a transport card was proposed, similar to London’s Oyster scheme. For young people, space to hang out and meet came out top of the list, along with the need for a coordinated strategy for people aged 20 to 30 years old, including housing and jobs. It was recognised that more consultation needed to be done among young people and their parents to understand their needs.